Just Jingle: It's Time for Another Skipping Stones Sketch Challenge! It's Time for Another Skipping Stones Sketch Challenge! First of all, I need to send a very special HAPPY BIRTHDAY, HUBBUMS to the most wonderful man in the world today! He makes me smile every.single.day and I love him more than anything! I'm so happy that we get to share this life together! YAY! Yes, folks, we have a brand new sketch challenge for you today at Skipping Stones Design! I have to tell you that I am particularly excited about today's sketch. You see, I'm a very symmetrical kind of girl. I like lines, balance, and general even-ness in my life. Today's sketch is completely NOT. ANY. OF. THAT. SO...it was a challenge for me to say the least! But, alas, I took out my Rustic Tiles set, my Sentiment Frames set, and some fabulous brads from our November partner, Creative Impressions, and went to it! It makes me happy. I stamped the tile in the red a couple of times and then cut them into quarters so I could mount them individually on the card. I love using non-traditional colors, but I was thrilled with how fabulous the traditional complimentary combination of red and green looked on this card! The green brads were the perfect finishing touch! Here is the sketch that we are all working with this week. Be sure to check out the other designer's work this week! They have created some FABULOUS stuff with this sketch and then don't forget to do your HOMEWORK! Create a card based on this sketch and link it up to Skipping Stones Design for your chance to win a set of free stamps! You don't have to use SSD stamps, but if you have them, we love to see them! excellent...love what yo did with the sketch! What a fab take on the sketch! I love it :) Happy day to the hubs, and to you too! love your take on the sketch~beautiful!!! Love that this is something different for a holiday card! Great use of the sketch! I totally forgot that we were to talk up Creative Impressions. OH man!!! 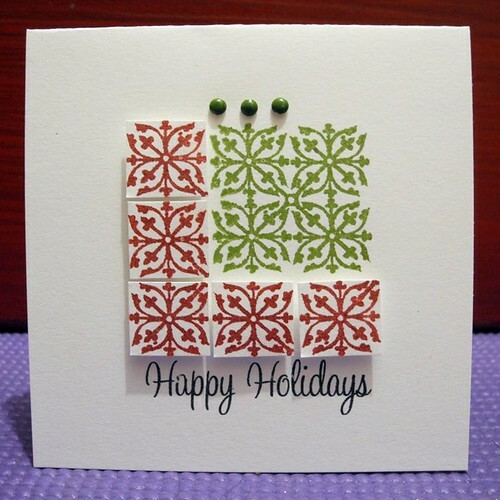 This card is so fabulous and after seeing, it was so hard not to mimic it!!! Happy Thanksgiving Super Star!! Very cute!!! So simple, and it's just lovely!!! 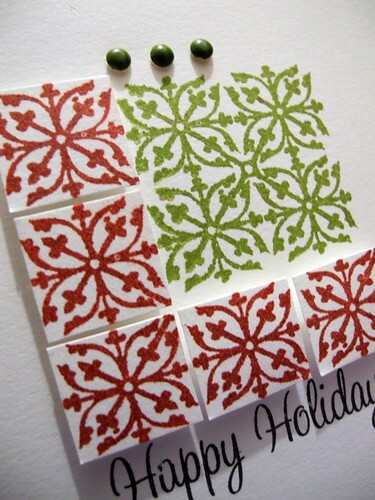 Deck the card with pretty tile stamps - falalalalalalalala! That's WONDERFUL! And happy BIRTHDAY, Hubbums! Love the card. Right up my alley - simple, yet elegant!! How cool and clean and oh so wonderfully graphic is your card. I love the modern vibe! this is just beautiful, love how you popped up the tiles! Your card is perfect take on this sketch. Your hubbums shares a birthday with me!! Happy birthday to him!!!! I really love what you've done with the sketch! Such a great, clean card. Love the dimension in the tiles! Jingle.......I was just awe-struck when I saw your card. The lines and simplicity were truly calling me. Just a gorgeous card!